We have had a warm spell up here in Alaska, perfect reason to uncloak the grill and awaken it from hibernation. I love the charred taste of bread fresh off the grill, a perfect base for pizza. This is one example of what you can do, if you don’t like arugula and proscuitto then go in a different direction. I would make sure all ingredients that need to be cooked are cooked and to go easy on the toppings. If this pizza gets overloaded the crust can burn before the cheese has had a chance to melt, and that high temp will give it that nice crust on the bottom. Some things I buy at the store that can be made at home (enchilada sauce), others I make myself. One of those that I make is pizza dough. It’s maybe 20 minutes of effort, and I always have the ingredients on hand. Flour, yeast, salt, water, olive oil. Having a few hours before dinner is needed though. I don’t usually measure when I’m making dough, except for the yeast. 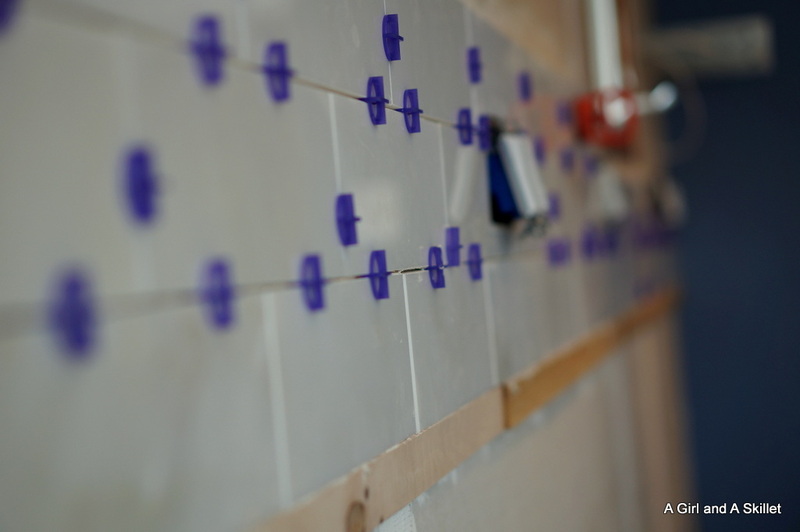 The amount of flour and water can vary depending on how compacted the flour is and how humid the environment is. If the dough is too wet, add a little flour, too dry then add some water. 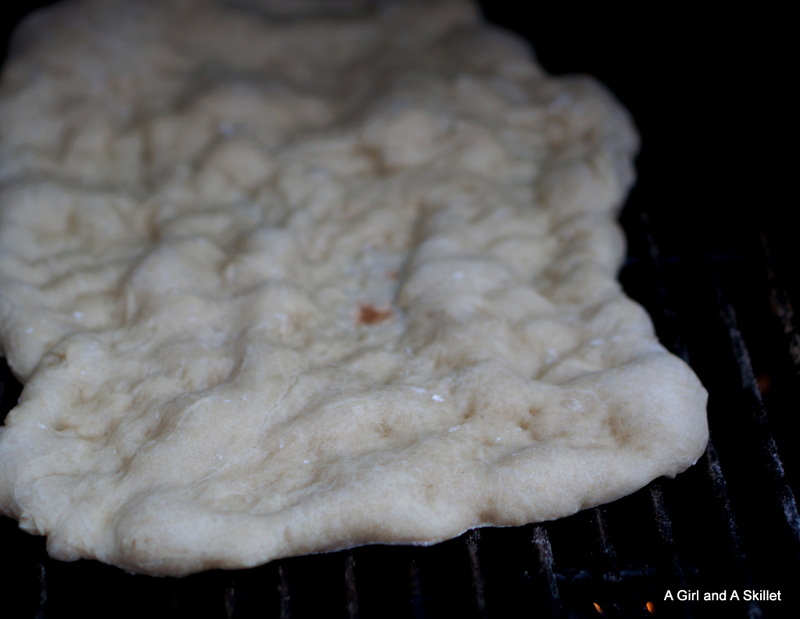 If you have a storebought dough, you can bake it on the grill the same way. It helps to have everything ready, so when you flip the crust, all the toppings can be added quickly and easily. Combine warm water and yeast in medium sized bowl and let sit for about 5 minutes until water is foamy. 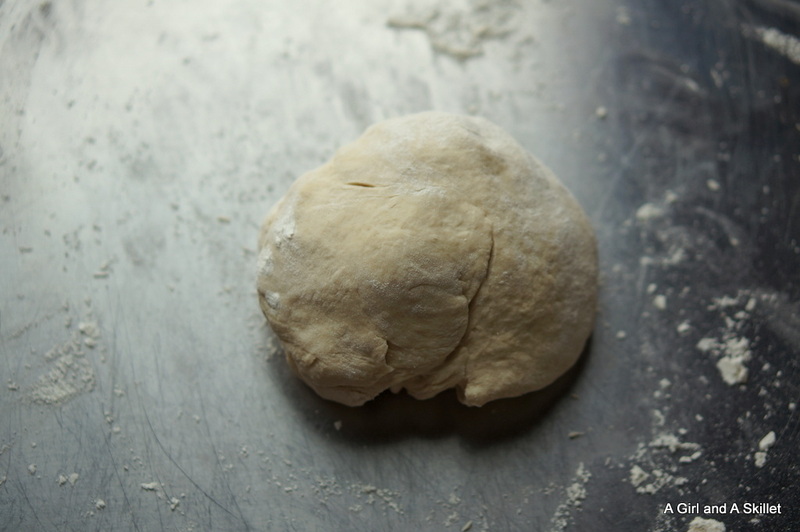 Add flour and stir with a fork or hands until dough is coming together. Then dump dough onto well floured surface. Knead dough about 10 minutes, dough should be smooth and elastic, still somewhat soft. Place dough in oiled bowl and cover with tea towel. Let rise until doubled in size, about 2-3 hours. Flour a large cutting board, gently stretch out dough to large pizza size. Can make smaller ones if prefered, will make approximately one 14" round pizza. Set grill to high on both burners. Temp around 500 degrees fahrenheit. Get all topping ingredients ready and place next to grill. Scrape down grill grates and oil with paper towel soaked in oil (hold with tongs). 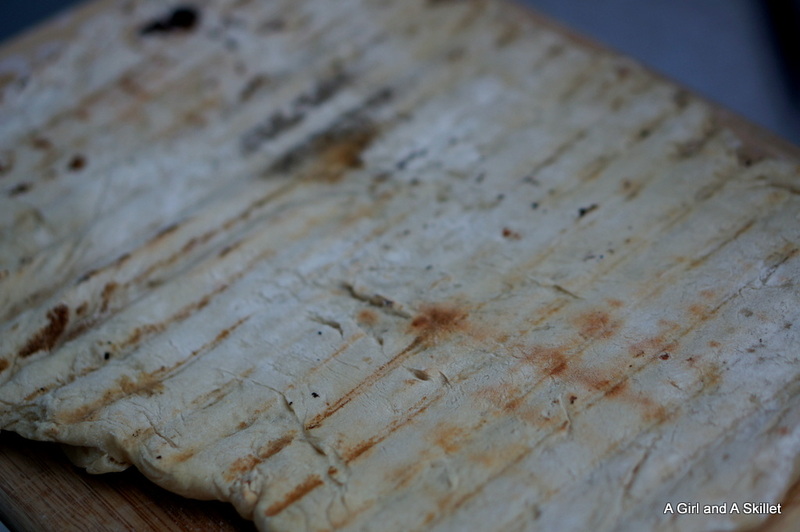 Using spatula, gently shake cutting board to loosen dough and place on grill surface. Close door and check in two minutes. 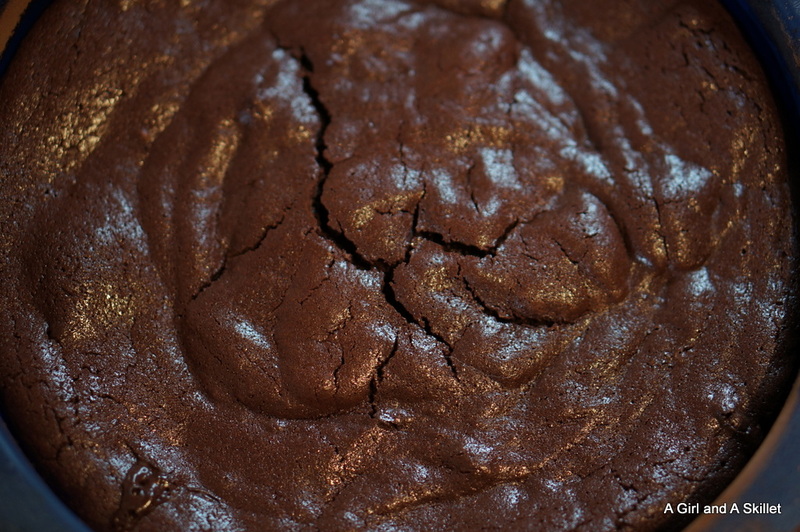 Dough should brown on the bottom with some blistering on top. 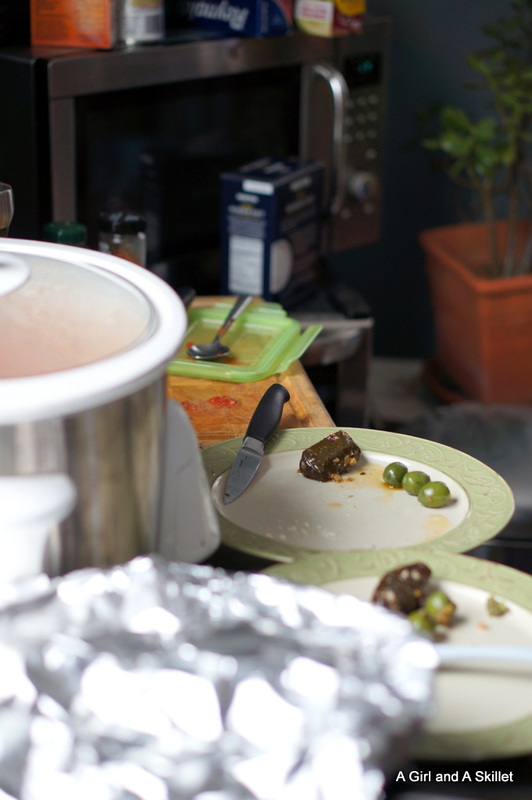 Remove crust from grill and place back on cutting board and close grill door. 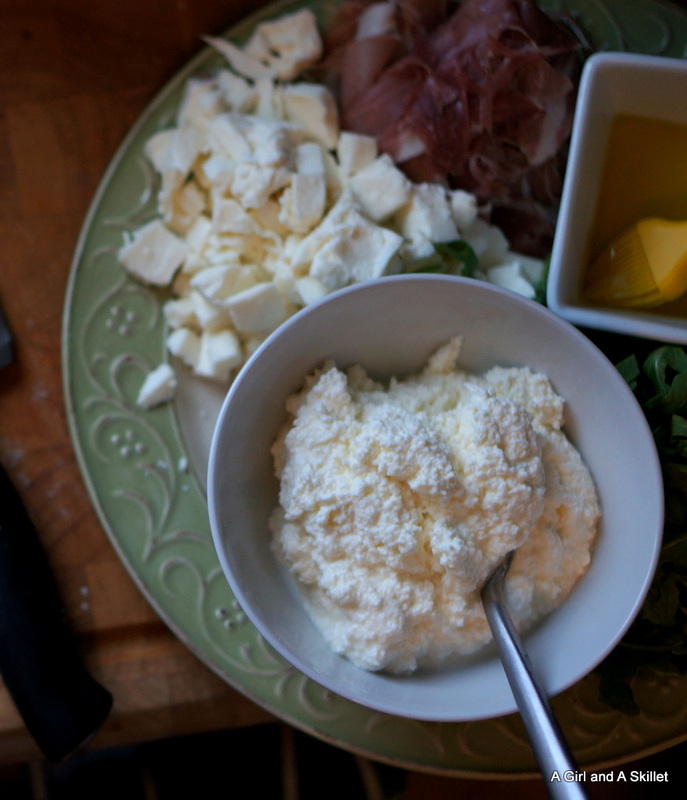 Flip crust over, brush with oil, then spread ricotta over. 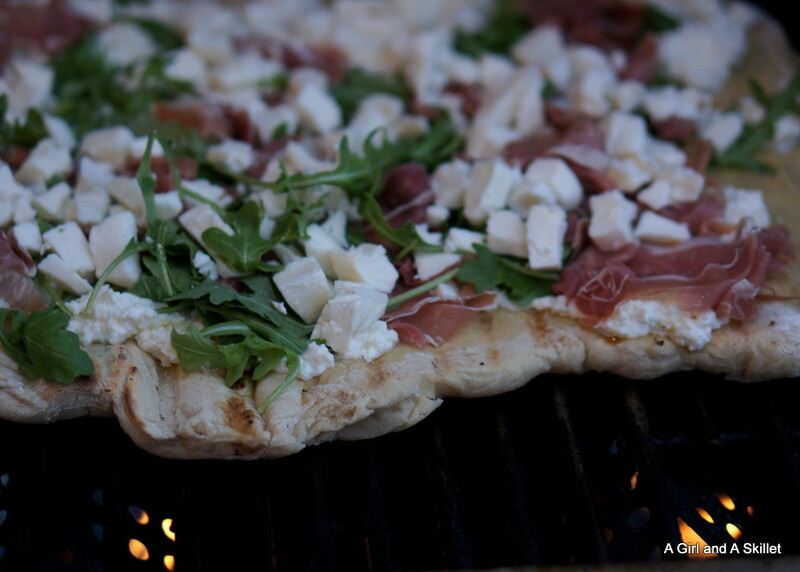 Then put on 1/3 of the arugula, proscuitto and mozzarella. Put pizza back on to grill surface and turn down heat to medium high, about 450. Check every couple minutes, wait for cheese to melt, bottom crust should be browning too (takes 4-5 minutes). Remove pizza from grill back onto cutting board. 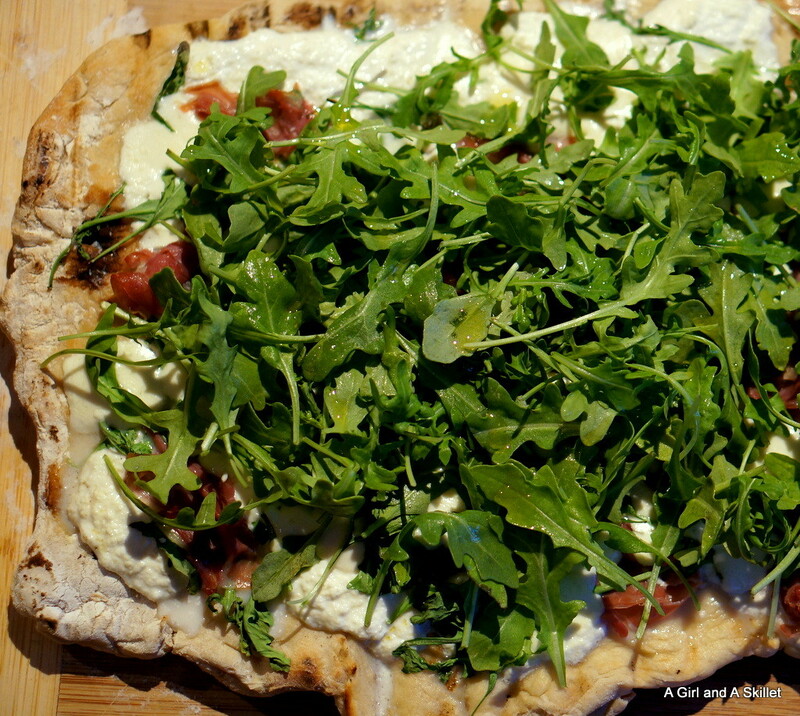 Spread rest of the arugula over the top and drizzle the truffle oil over top. Let rest for 5 minutes or so, slice and enjoy. You can substitute bacon or ham if you don't have proscuitto, can usually find it in the deli section of the grocery store. 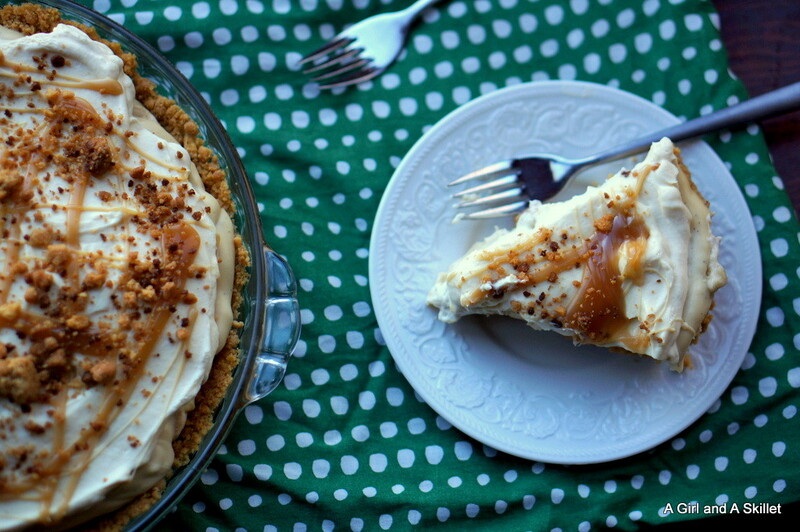 I don’t really like banana cream pie, well I didn’t before. But when you are pregnant sometimes the urge strikes. 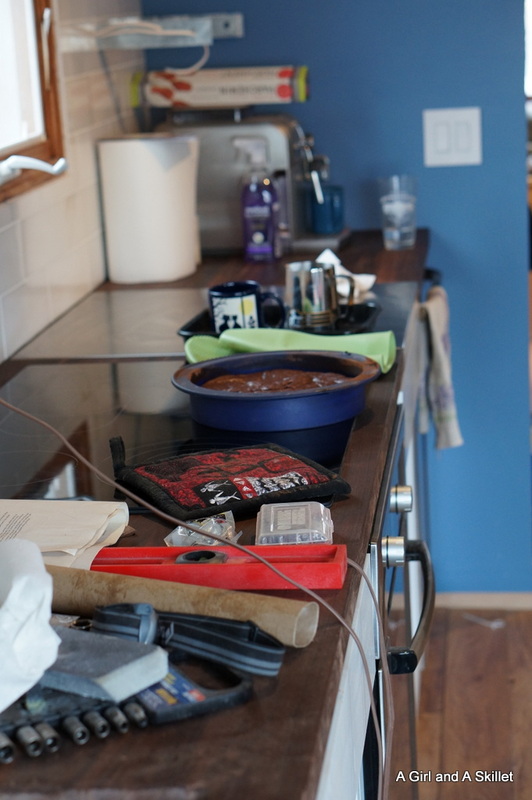 Doesn’t hurt that it happens to be Pi(e) day, a very special one on 3.14.15! When I think of banana cream pie I think of the cafeteria at the hospital, with its rotating dessert case. Gritty chocolate puddings with cool whip and sprinkles. They had been sitting long enough that the sprinkles were starting to dissolve and dye the cool whip in bright neon splotches. 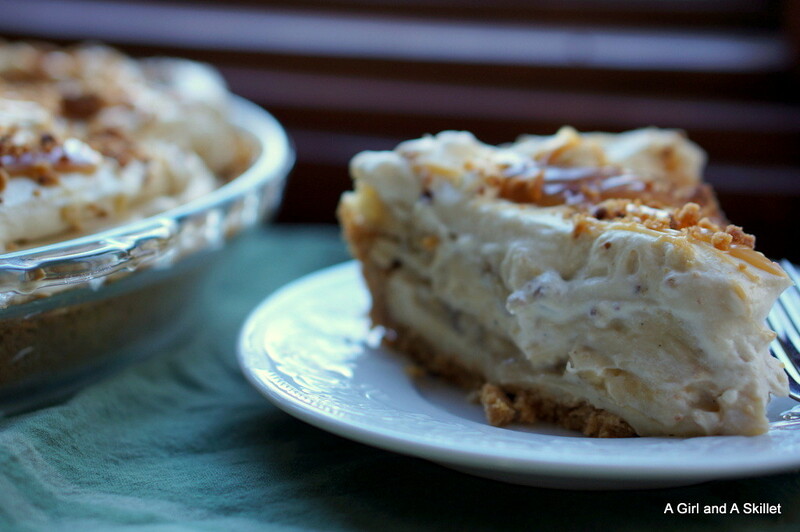 Then the banana cream pie rotated slowly, beige, soggy and sad. But now for some reason, I think of it as comfort food. 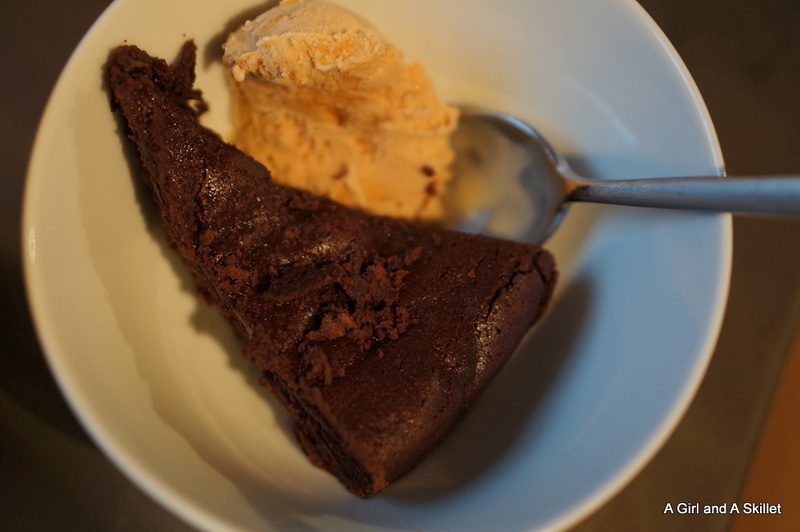 If you have read my previous post then you will know why I might need some comfort food. Like if you broke up with your boyfriend and you were upset and went to see your favorite aunt, she would give you a slice of this. No, she didn’t bring it home from the hospital, she made it. Made it with love for someone who needs comforting. 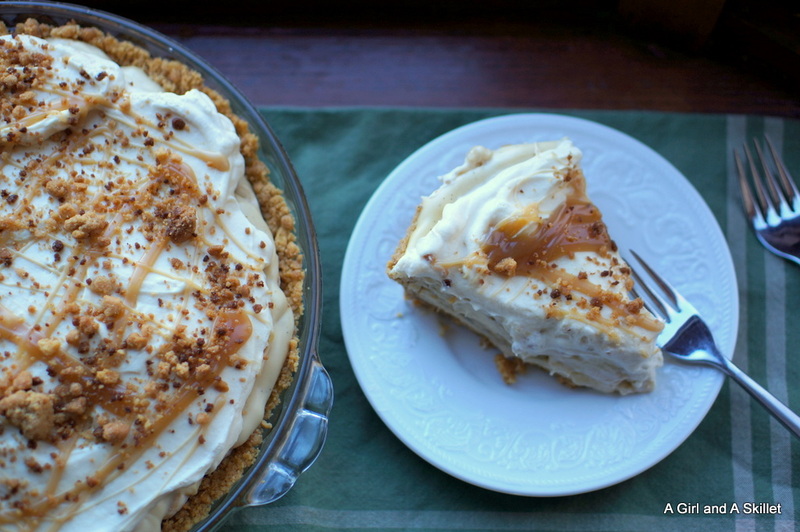 The recipe uses a crust made from honey graham crackers, the ones I used were Annie’s bunny grahams, because that’s what I could find at the store. It’s what makes shopping at your small local grocery store fun. I also liked the less grahamy flavor. I crushed the crackers bunnies using a plastic baggie and a glass. This makes a coarser and more irregular crumb and is more work, but meh. Sometimes I am willing to go through tedious extra work if it involves using less brain power to find a quicker way. This recipe makes a lot of crust, so the extra crumbs I toasted on a baking sheet on the side and added on top for a little crunch. 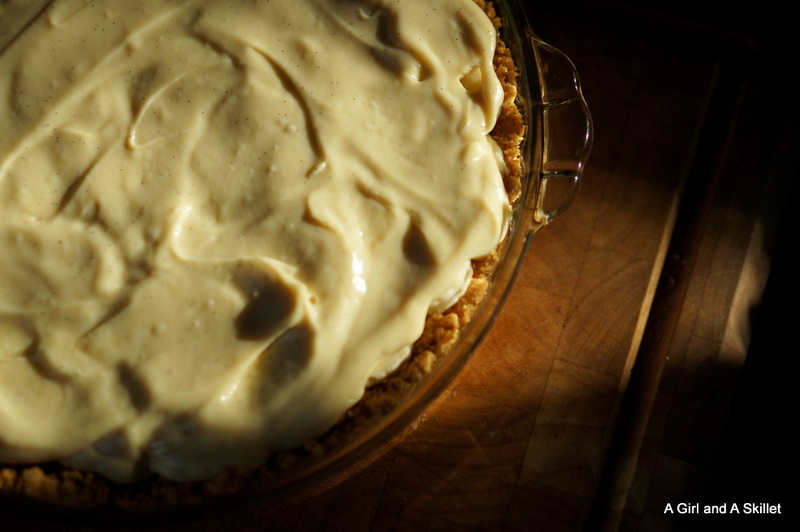 The filling is a vanilla custard with vanilla bean and extract, and just a touch of brandy. I used store bought salted caramel sauce because I am still mad at caramel for being so easy in the beginning and then turning on me. I also don’t want to wash crystallized caramel out of my pan in the bathroom. Combine crumbs, cinnamon, sugar and butter in a bowl and mix until resembling coarse sand. Put in a 9" pie plate and press around bottom and sides evenly. If you have extra crumbs put them on a cookie sheet. 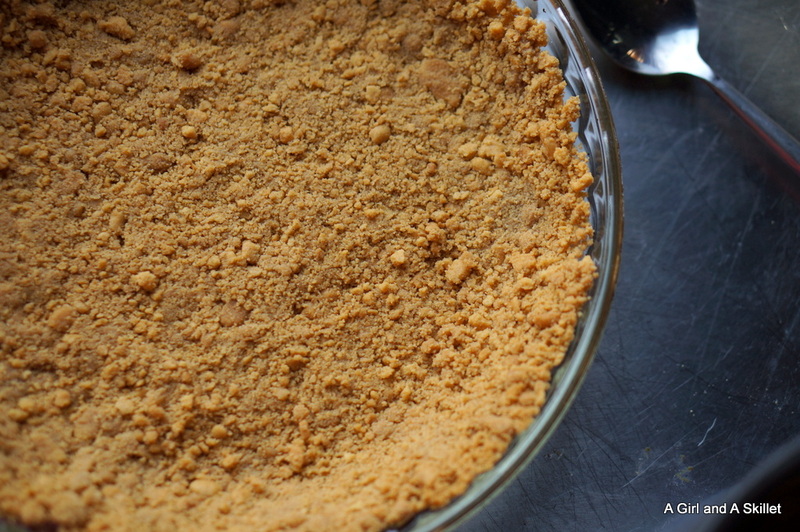 Bake crust and crumbs in oven about 10 minutes. Let cool. Whisk together sugar, cornstarch and salt in a saucepan. 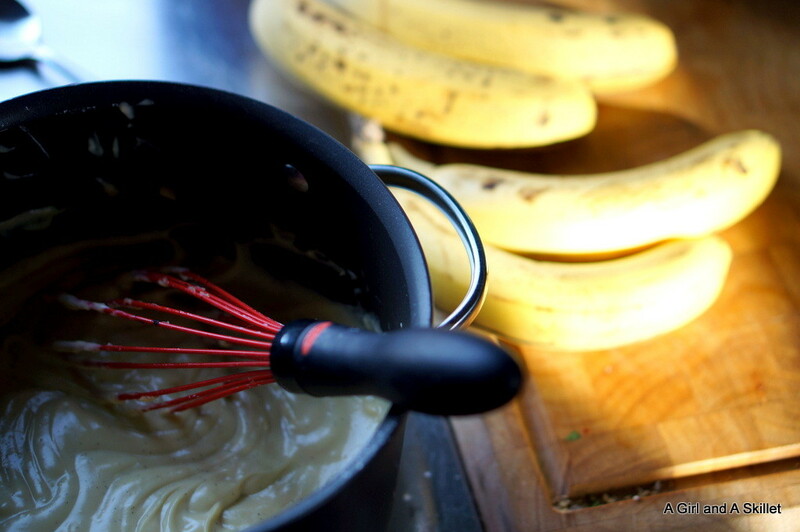 Gradually whisk in cream, milk and egg yolks. 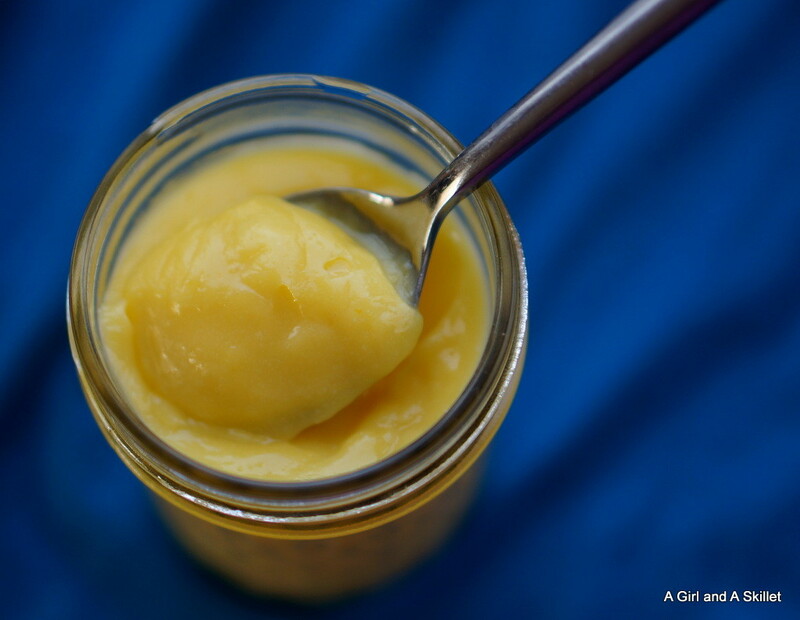 Cut vanilla bean in half lengthwise, scrape out the seeds and add to custard along with vanilla bean. Heat on medium high heat, while stirring until thickened, about 6-8 minutes. Remove from heat, stir in butter, vanilla and brandy. 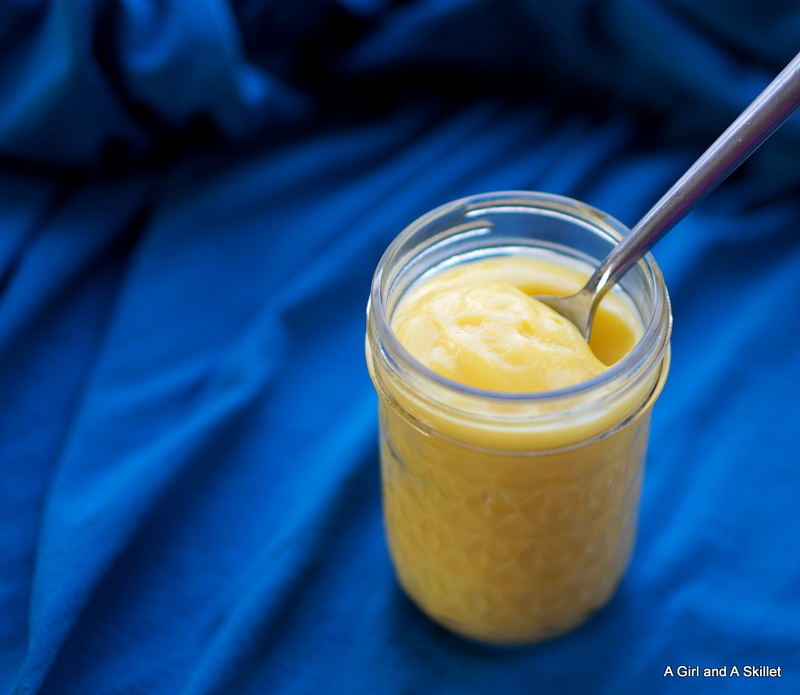 Let cool until warm to room temperature, stirring occasionally, remove vanilla bean. 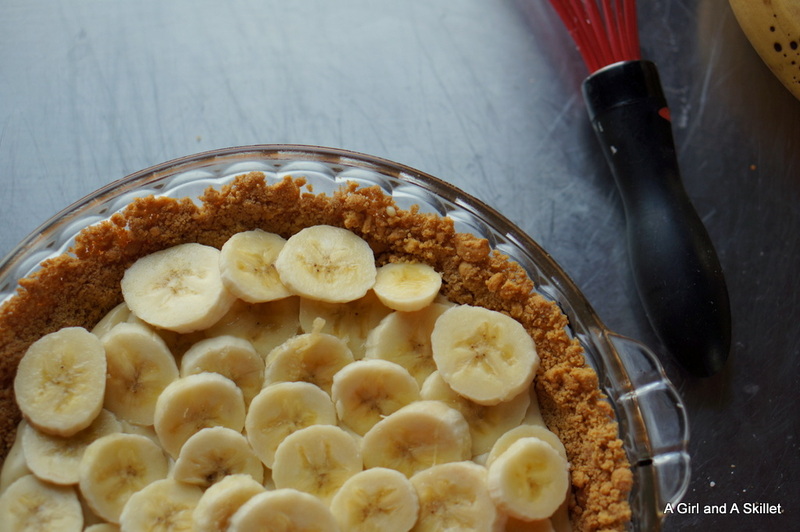 Add about a cup of custard to cooled crust, layer half the bananas, then another layer of custard and remaining bananas. Add last of custard over top. Let set in the fridge for 6-8 hours. Before serving prepare whipped cream by chilling cream, bowl and whisk or beaters. Place caramel in bowl and pour cream over top. Stir initially to mix togeter then beat on high until soft peaks but do not overbeat. Spread over pie, use extra caramel to drizzle over top. Spread crust crumbs on top and serve. This pie will keep in the fridge for a day or two covered in plastic wrap. Some nights I’m hard to please. 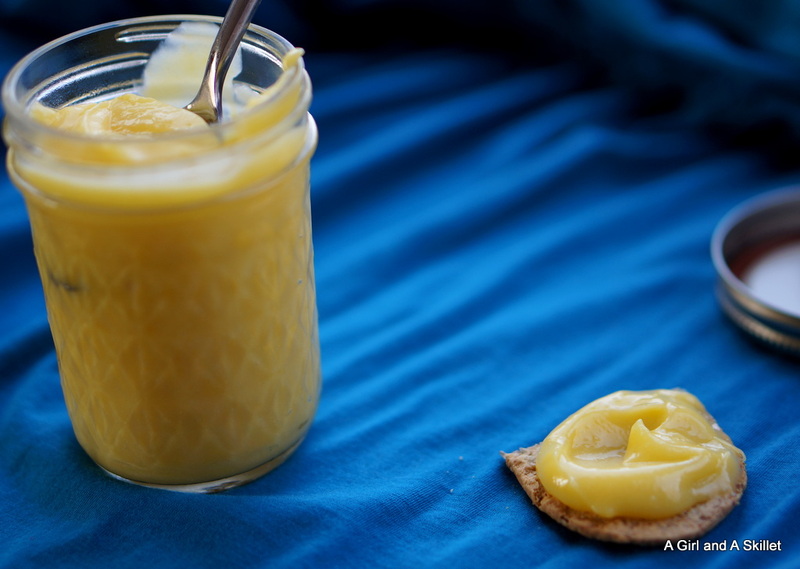 I want something decadent, flavorful and easy to prepare on a weeknight. I’m tired from working and want a great dinner, but I want to wear sweat pants so going out is not an option. Walk in the door, pet the cats, turn on my Pink Martini Pandora mix and make some mushroom toast. This can be made in one pan, unless you want to fry your toast instead of the toaster which I always recommend, nothing beats it. You can use any mushrooms you want, I went with meaty portobellos. 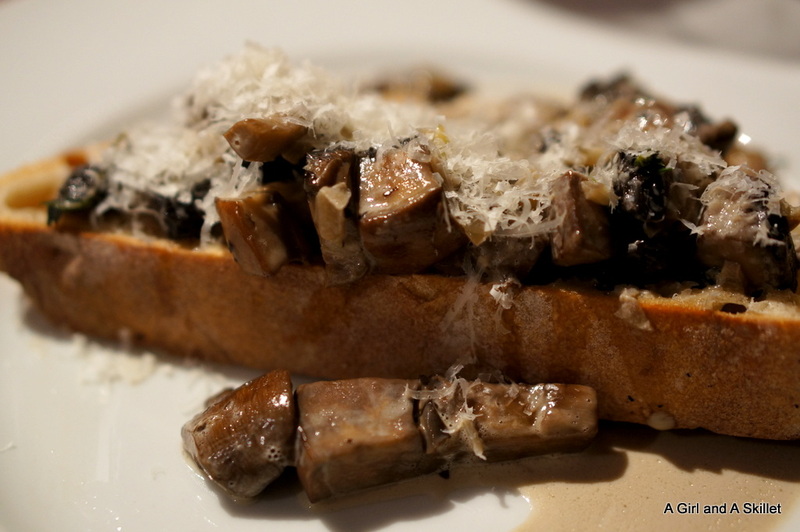 Chanterelle, morels, oyster are all options. The mushrooms are the star here so do try to pick some high quality ones if available. This makes a filling dinner, you won’t miss the meat, I added a simple arugula salad with lemon vinaigrette to balance it out. 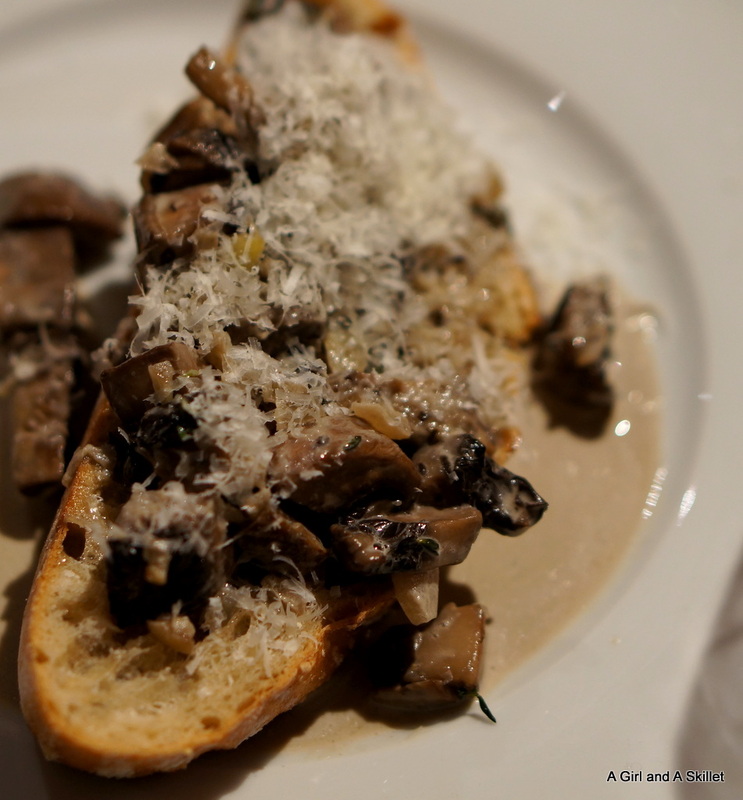 Clean mushrooms with a damp towel to remove dirt, trim off bottom of stems, chop into approximately 1/2 inch chunks. Place a large skillet or dutch oven over medium heat, melt butter, add onion and cook 3-4 minutes, then add garlic, thyme and mushrooms. 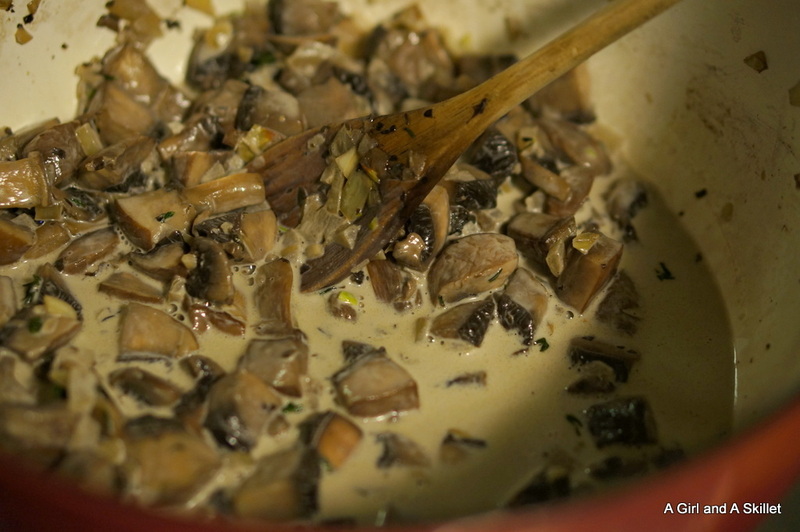 Cook mushrooms until they have released all their liquid, about 8-10 minutes. 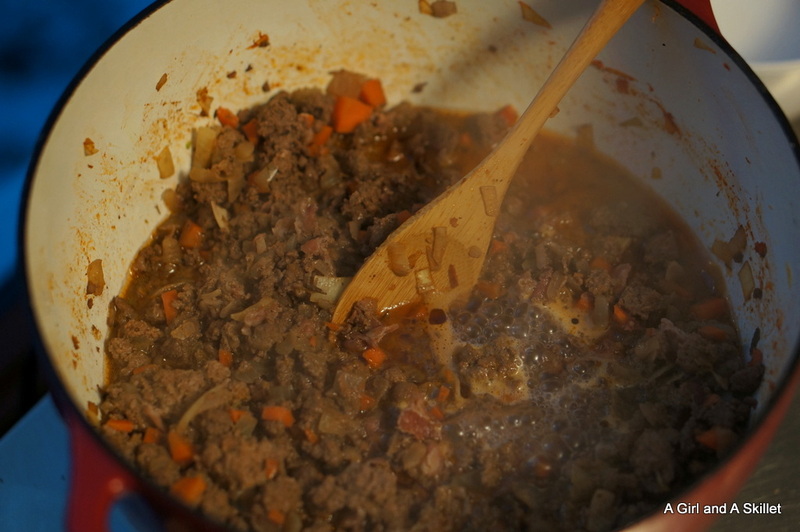 Add brandy to pan and let reduce slightly. Toast bread and place two slices on each plate. Remove from heat and add half of Parmesan cheese. 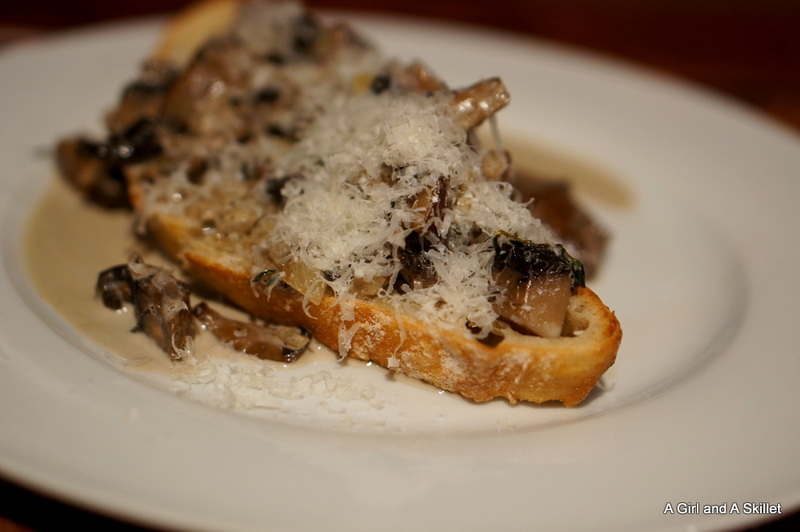 Pour mushrooms evenly over toast slices and sprinkle remaining Parmesan over top.